The change log includes a detailed description of all changes to this distribution in the recent releases. Upgraded the included OpenSSL libraries to 1.0.2j. CVE-2016-6304 A malicious client can send an excessively large OCSP Status Request extension leading to a DoS attack. CVE-2016-6306 Some missing message length checks can result in OOB reads, which could be used for DoS attacks. Updated the Mozilla CA root bundle to the current version as of 2016-11-10. Switched the included OpenSSL libraries to 1.0.2h. CVE-2016-2108 Two bugs in the ASN.1 parser were found which could cause memory corruption issues. CVE-2016-2107 A MITM attacker can use a padding oracle attack to decrypt traffic when the connection uses an AES CBC cipher and the server support AES-NI. This issue was introduced as part of the fix for Lucky 13 padding attack (CVE-2013-0169). Several low priority issues were fixed as well. Updated the Mozilla CA root bundle to version 2016-04-16. CVE-2016-0800 (DROWN attack) A cross-protocol attack was discovered that could lead to decryption of TLS sessions by using a server supporting SSLv2 and EXPORT cipher suites as a Bleichenbacher RSA padding oracle. As additional result of this attack, the default OpenSSL configuration no longer includes the SSLv2 protocol support starting with 1.0.1s. Several low priority issues related to memory leaks. Disabled SSLv2 support in all our OpenSSL library builds (no-ssl2). Disabled TLS compression in all our OpenSSL library builds (no-comp). This may lead to problems with other libraries that still expect to find these APIs. pyOpenSSL itself does not use them. Updated the Mozilla CA root bundle to version 2016-03-01. Nothing much changed, except the date of the bundle file. CVE-2015-3197 If SSLv2 was not disabled via SSL_OP_NO_SSLv2, a client could negotiate SSLv2 ciphers that have been disabled, even if all SSLv2 ciphers have been disabled. Updated the Mozilla CA root bundle to version 2016-01-19. CVE-2015-3194 The signature verification routines will crash with a NULL pointer dereference, if presented with an ASN.1 signature using the RSA PSS algorithm and absent mask generation function parameter. This can be exploited in as DoS attack in applications which performs certificate verification. CVE-2015-3195: When presented with a malformed X509_ATTRIBUTE structure OpenSSL will leak memory. CVE-2015-3196: If PSK identity hints are received by a multi-threaded client, then the values are wrongly updated in the parent SSL_CTX structure. This can potentially lead to a double free of the identify hint data, leading to a segfault. Updated the Mozilla CA root bundle to version 2015-10-27. Added support to allow building wheels from source or prebuilt packages. CVE-2015-1793: An error in the implementation of the alternative certificate chain logic could allow an attacker to use a regular server leaf certificate as CA certificate. Updated included OpenSSL libraries from OpenSSL 1.0.1n to 1.0.1o, which fixes an ABI incompatibility introduced in OpenSSL 1.0.1n. Fixed a bug in the build process which resulted in the CA bundle files not get installed in the OpenSSL/ package dir. Added a work-around for recent pip versions not showing the installer output, causing an apparently hanging installation process. The installer will now use a timeout when entering the crypto confirmation and report how to fix the problem (by using an environment variable EGENIX_CRYPTO_CONFIRM for confirmation). Updated the Mozilla CA root bundle to version 2015-04-22. Logjam attack: OpenSSL 1.0.1n includes DHE man-in-the-middle downgrade protection. CVE-2015-1788: Possible infinite loop during client authentication, which can be used for Denial of Service (DoS) attacks. CVE-2015-1789: X509_cmp_time does not properly check the length of the ASN1_TIME string and can read a few bytes out of bounds, which can lead to a segmentation fault. CVE-2015-1790: The PKCS#7 parsing code does not handle missing inner EncryptedContent correctly, which can lead to a NULL pointer dereference on parsing. CVE-2015-1792: When verifying a signedData message the CMS code can enter an infinite loop if presented with an unknown hash function OID. CVE-2015-1791: If a NewSessionTicket is received by a multi-threaded client when attempting to reuse a previous ticket then a race condition can occur potentially leading to a double free of the ticket data. Various minor fixes to the web installer to make installations on Linux and FreeBSD more robust, having pip uninstall not remove the .pyc/.pyo files, intermittent error causing a source installation in some rare cases. Added FreeBSD as supported platform. Updated the Mozilla CA root bundle to version 2015-02-19. CVE-2015-0286: Segmentation fault in ASN1_TYPE_cmp. CVE-2015-0287: ASN.1 structure reuse memory corruption. CVE-2015-0289: PKCS#7 NULL pointer dereference. CVE-2015-0292: A vulnerability existed in previous versions of OpenSSL related to the processing of base64 encoded data. Any code path that reads base64 data from an untrusted source could be affected (such as the PEM processing routines). Already fixed in OpenSSL 1.0.1h, but wasn't listed, so repeated here for completeness. CVE-2015-0293: Denial-of-Service (DoS) via reachable assert in SSLv2 servers. CVE-2015-0209: Use After Free following d2i_ECPrivatekey error. A malformed EC private key file consumed via the d2i_ECPrivateKey function could cause a use after free condition. CVE-2014-8275: OpenSSL accepts several non-DER-variations of certificate signature algorithm and signature encodings. OpenSSL also does not enforce a match between the signature algorithm between the signed and unsigned portions of the certificate. By modifying the contents of the signature algorithm or the encoding of the signature, it is possible to change the certificate's fingerprint. CVE-2014-3572: An OpenSSL client will accept a handshake using an ephemeral ECDH ciphersuite using an ECDSA certificate if the server key exchange message is omitted. This effectively removes forward secrecy from the ciphersuite. CVE-2015-0204: An OpenSSL client will accept the use of an RSA temporary key in a non-export RSA key exchange ciphersuite. A server could present a weak temporary key and downgrade the security of the session. This is also known as FREAK Attack. CVE-2014-3570: Bignum squaring (BN_sqr) may produce incorrect results on some platforms, including x86_64. This bug occurs at random with a very low probability, and is not known to be exploitable in any way, though its exact impact is difficult to determine. CVE-2015-0205: An OpenSSL server will accept a DH certificate for client authentication without the certificate verify message. This effectively allows a client to authenticate without the use of a private key. This only affects servers which trust a client certificate authority which issues certificates containing DH keys: these are extremely rare and hardly ever encountered. Reenabled the SSLv2 support in the bundled OpenSSL libraries which we had removed in 0.13.5, since removing the SSLv2 symbols resulted in too many compatibility problems with existing code such as e.g. The ImportError is the result of using the 0.13.5 version of the OpenSSL libs with an ssl module which was compiled against a system version with SSLv2 support, effectively making the ssl module unusable. To protect against SSLv2 and SSLv3 downgrade attacks, please make sure you setup the SSL context to disallow using SSLv2 and SSLv3, e.g. OpenSSL.__version__ is now updated to the distribution version rather than left at "0.13" as it was in previous releases. It now shows "0.13.6" for this release. Emphasized on the need to "import OpenSSL" early to prevent Python from loading the system OpenSSL libraries instead of the embedded ones. Be sure to read the section Loading the embedded OpenSSL Libraries of the documentation for details on how to make sure that the embedded libraries are loaded. CVE-2014-3567: Memory leak in OpenSSL session ticket management. OpenSSL has added support for TLS_FALLBACK_SCSV to allow applications to block the ability for a MITM attacker to force a protocol downgrade, e.g. to enable a POODLE (CVE-2014-3566) attack by forcing a downgrade to SSLv3. This is enabled automatically for servers. CVE-2014-3568: OpenSSL configured with "no-ssl3" would still allow a complete SSL 3.0 handshake to run. Dropped zlib support from OpenSSL builds to more easily prevent the CRIME attack without having to use special SSL context options. Disabled the SSLv2 support in OpenSSL builds. SSLv2 has long been broken and this simplifies writing secure servers/clients. Updated the included CA root certificate bundles to Mozilla's 2014-08-26 update. Improved cipher list in https_client.py example which prefers the newer AES128-GCM and elliptic curve DH over over ciphers. Added new context flag MODE_SEND_FALLBACK_SCSV. Documented previously undocumented MODE_RELEASE_BUFFERS and removed non-existing MODE_NO_COMPRESSION from the documentation. Added web installer package to the Python Package Index (PyPI) which simplifies installation. The web installer will automatically detect the platform and choose the right binary download package for you. All downloads are verified before installation. Resolved a problem with a pyOpenSSL test for certificate extensions: OpenSSL 1.0.1i+ wants a signature algorithm to be defined when loading PEM certificates. Moved eGenix additions to pyOpenSSL to a new extras/ dir in the source distribution. In previous releases, we also added the OpenSSL version number to the package version. Since this causes very long version numbers, we have dropped the OpenSSL version starting with 0.13.5 and will only increase the main version number from now on. In the future, we plan to switch to a new version scheme that is compatible with our normal version number scheme for products. CVE-2014-3511: A flaw in the OpenSSL TLS server code allows a man-in-the-middle attacker to force a downgrade to TLS 1.0. Compiled pyOpenSSL with OPENSSL_LOAD_CONF to have the OpenSSL libs automatically load the openssl.cnf configuration file. This allows easy configuration of additional OpenSSL parameters and defaults, locations of certificate files, hardware engines, etc. without having to change the application code. Please see the documentation for details. Updated the included CA root certificate bundles to Mozilla's 2014-07-15 update. CVE-2014-0224: An attacker can force the use of weak keying material in OpenSSL SSL/TLS clients and servers. This can be exploited by a Man-in-the-middle (MITM) attack where the attacker can decrypt and modify traffic from the attacked client and server. CVE-2014-0221: By sending an invalid DTLS handshake to an OpenSSL DTLS client the code can be made to recurse eventually crashing in a DoS attack. Only applications using OpenSSL as a DTLS client are affected. CVE-2014-3470: OpenSSL TLS clients enabling anonymous ECDH ciphersuites are subject to a DoS attack. Added the following new options for context.set_options(): OP_TLSEXT_PADDING, OP_SAFARI_ECDHE_ECDSA_BUG, OP_NO_SESSION_RESUMPTION_ON_RENEGOTIATION, OP_ALLOW_UNSAFE_LEGACY_RENEGOTIATION. Documented all supported context.set_options() options (to the extent possible using the OpenSSL documentation itself). Updated the included CA root certificate bundles to Mozilla's 2014-04-22 update. Updated pyOpenSSL to the upstream trunk revision 171 (pyOpenSSL version 0.13.1+). Added work-around for compiling pyOpenSSL trunk revision 171 on Windows with OpenSSL 1.0.0 and later. Included support for TLS 1.1 and 1.2 in pyOpenSSL (rev 171). Please see the TLS support section in the documentation for details. Added SSL.OP_NO_COMPRESSION and SSL.OP_SINGLE_ECDH_USE context options to be able to address the CRIME attack and allow for more secure elliptic curve Diffie-Hellman key exchange setups. Added HTML Sphinx documentation from the pyOpenSSL trunk version to the package. An online version is available from our website. Updated the included CA bundles to the latest Mozilla 2014-01-28 version. Included ca-bundle*.crt files now have the same modification date as the Mozilla certdata.txt file from which they were generated. Restored compatibility of the ca_bundle module with Python 2.4. CVE-2013-4353: A carefully crafted invalid TLS handshake could crash OpenSSL with a NULL pointer exception. A malicious server could use this flaw to crash a connecting client. CVE-2013-6450: A flaw in DTLS handling can cause an application using OpenSSL and DTLS to crash. CVE-2013-6449: A flaw in OpenSSL can cause an application using OpenSSL to crash when using TLS version 1.2. Added a patch by Christian Heimes to pyOpenSSL: This addresses the CVE-2013-4238 related problem with embedded NUL bytes in subjectAltNames and also fixes a memory leak in the X509 .get_extension() method. Christian Heimes also pointed us to a problem with the included CA root bundle, which turns out to be rather wide-spread. Mozilla's certificate bundle includes more than just the trusted CA root certificates. It also includes several explicitly untrusted root certificates and even single untrusted server certificates. Our investigation showed that while OpenSSL does handle trust parameters in the certificates, it doesn't use this information during certificate verification, if the certificate is passed in together with other trusted certificates. Future OpenSSL versions may add this support, but at least versions up to and including 1.0.1e don't have it. To work around this problem, we have split the bundle file into separate bundles, each with different trust settings included. The explicitly untrusted certificates are no longer included in the lists to avoid potentially trusting these untrusted (root) certificates. Many thanks to Christian Heimes for these reports. Added new TRUST_* constants to the OpenSSL.ca_bundle module and new purpose parameters to various bundle query functions. Updated the documentation to reflect the changes and document the new set of CRT certificate files and trust settings. Fixed a missing import in the https_client.py example. Changed the package version scheme to be PEP 386 compatible. The new scheme no longer contains underscores or patch level letters. Added a CA root certificate bundle file ca-bundle.crt, which is created from the current Mozilla root CA certificate list. This allows verifying server certificates without having to rely on the system root CA certificate list. The bundle file will be updated with each new release of eGenix pyOpenSSL. We also make the file available as separate download. Please see the product page for details. Added pyOpenSSL examples/ directory to the source distribution. Added a new OpenSSL.ca_bundle module which provides easy to use access to the embedded ca-bundle.crt file. Added new example https_client.py to the examples/ directory, which demonstrates setting up an SSL connection and using the new OpenSSL.ca_bundle module. Windows x64 builds now have assembler code turned back on again, after a problem with OpenSSL 1.0.1c. Upgraded the included OpenSSL library from version 1.0.0j to version 1.0.1c. See http://www.openssl.org/news/news.html and http://www.openssl.org/news/vulnerabilities.html for a complete list of changes. Added the openssl binary to the OpenSSL package directory. 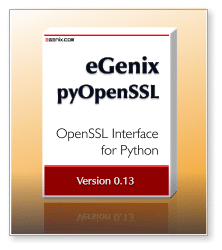 This can be used to access OpenSSL functionality not exposed by pyOpenSSL. Changed the Windows OPENSSLDIR default to c:\openssl\ to simplify OpenSSL configuration. Fixed OpenSSL assembler build issues on Windows x64 and Mac OS X PPC/x86. Upgraded the included OpenSSL library from version 1.0.0g to version 1.0.0j. See http://www.openssl.org/news/news.html and http://www.openssl.org/news/vulnerabilities.html for a complete list of changes. Upgraded the included OpenSSL library from version 1.0.0a to version 1.0.0g. See http://www.openssl.org/news/news.html and http://www.openssl.org/news/vulnerabilities.html for a complete list of changes. Upgraded the included pyOpenSSL library from version 0.10 to version 0.13. See these announcements for a summary of changes: pyOpenSSL 0.11, pyOpenSSL 0.12, pyOpenSSL 0.13. Updated the pyOpenSSL license information from LGPL to Apache License 2.0. Added support for Python 2.7 on all platforms. Added documentation for automatic download of egg distributions using compatible tools such as easy_install and zc.buildout. Upgraded the included OpenSSL library from version 0.9.8l to version 1.0.0a. See http://www.openssl.org/news/news.html for a complete list of changes. Upgraded the included pyOpenSSL library from version 0.9 to version 0.10. See the announcement for a summary of changes. Added support for Win64 and precompiled Python 2.6 compatible binaries for that platform (you can find the OpenSSL libs in openssl-win64/vc9). Added support for Mac OS X 10.6 on Intel x64. Added .egg Distributions for Python 2.4 as well (in order to support Plone 3). Upgraded the included OpenSSL libraries to version 0.9.8l, which includes a number of important bug fixes related to SSL, most notably the work-around for the Man-in-the-Middle (MitM) TLS vulnerability disclosed on Nov. 5th, tracked as CVE-2009-3555. IMPORTANT: The work-around chosen by the OpenSSL team is to disable SSL session renegotiations altogether. This can cause applications relying on this feature on the client or server side to fail. You can still download the previous version of our pyOpenSSL distribution if you run into such problems. Upgraded the included pyOpenSSL library to version 0.9, which includes a new fix for the threading problems of version 0.8 and several new features. Upgraded the included OpenSSL libraries to version 0.9.8k, which includes a number of important bug fixes related to SSL. Added support for Mac OS X and pre-built archives for this platform. Fixed a serious problem with pyOpenSSL 0.8.0 and multi-threaded applications: the new threading fixes cause invalid thread states in the Python interpreter which resulted in random core dumps and seg faults. The patch was provided by Maxim Sobolev on SourceForge. Note that this patch has not yet been integrated into upstream pyOpenSSL. Added pre-built archives for Windows upon request from the Plone people: this makes it easier to integrate the archives into buildout scripts. Upgraded the included OpenSSL libs to version 0.9.8j, which fixes a vulnerability found in earlier OpenSSL releases of the 0.9.8 branch: CVE-2008-5077. Enabled zlib compression support in OpenSSL for both the Linux and Windows builds, so OpenSSL client/servers can now negotiate on-the-fly zlib compression for SSL connections.